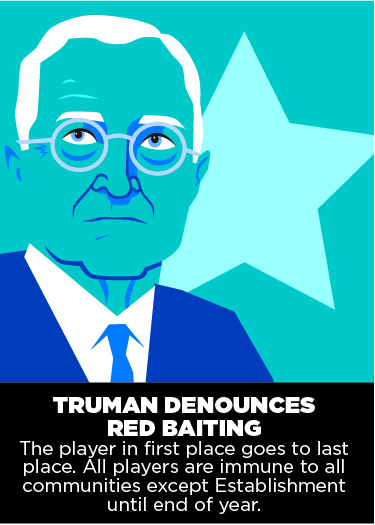 Ilinx announces the release of its 1950s McCarthy-era card drafting game of social shaming - Red Menace! Over four years, 1951-1954, players take on the role of a community member in a typical American town. Your goal - ensure that in an age of ratting out, selling out and conspiracy that you emerge the least tainted, the least disgraced and the least shamed. The only effective way to do this, of course, is to ensure that the attention of the authorities remain firmly fixed on everyone else. Game play is straightforward. On your turn you select a card from a hand of cards and choose which player in your judgment would be the most damaged by that card. And then you play that card on that player and watch them rack up levels of social shame that would make anyone's grandmother blush. Of course, every other player is lining up to do the same to you, but hey, that's just business in a time of betrayal, me-first and "do it to Julia." Global Crisis cards are resolved each season that can dramatically change the "facts on the ground," as they absolutely did during this historical period. While being historically-informed, this game isn't slavishly historical. The global crises, "ordering institutions" and other obstacles are all directly historical or are composites (like the characters). We hope you'll enjoy it as a straightforward social game. Once you get the procedure down, the game play itself should take between 30 and 40 minutes. Don't dwell on what you're going to do - almost everything in the game brings social shame to your opponents, after all!